Hospitality Care Longmont: Is It Time To Donate Your Old Clothes To OUR Center? When it comes to certain pieces of clothing, it’s likely that you want to hold onto them. Something like your mother’s favorite college sweatshirt or that t-shirt from the summer camp you went to as a kid hold sentimental value. On the other hand, there is likely a lot of clothing in your closet and drawers that you haven’t worn in quite some time. While it is certainly tempting to hold onto all of your clothing (after all, you never know when you’re going to need to fit back into that dress you wore when you were 17), letting go of your closet clutter is a great way to not only get rid of the excess, but also to help out others. At OUR Center, we take clothing donations so that we can add more to our community closet. 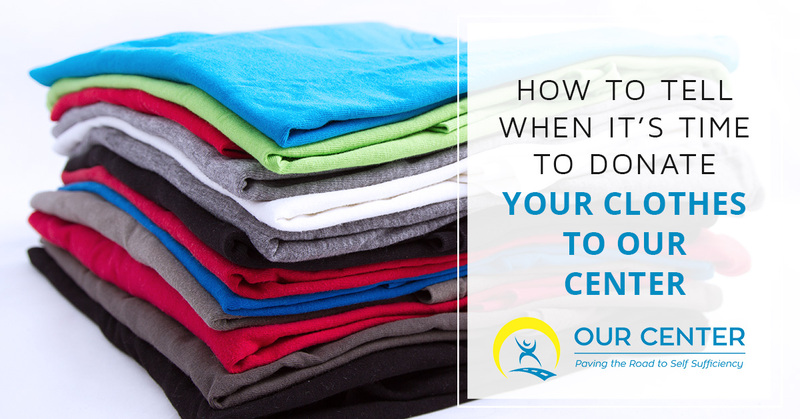 If you want to know how to tell when it is time for you to get rid of the clothing you aren’t using and donate them to someone in need, continue reading below. Has Your Personal Style Evolved? It is true that some pieces never go out of style. On the other hand, you are constantly changing as a person and so is your personal sense of fashion. With this being said, it’s important that you are truthful with yourself when looking in your closet. Is an article of clothing truly “vintage” or are you just holding onto something that you won’t wear ever again? Sure, it may have been something you loved a few years ago, but it may be better suited for someone else’s wardrobe now that your style has evolved. Is Your Clothing Too Big Or Too Small? When it comes to looking good, fit is the most important aspect. If your clothing doesn’t fit correctly, it’s time to say “goodbye”. Sure, it might fit you once again at a later point, but until then, it is only taking up room in your closet. Not to mention, if you manage to be that size once again, you can just purchase new clothing that fits properly. If you aren’t quite ready to donate your clothing, try a simple trick. Place the clothing you are thinking about donating in a garment bag for now. If you do not think about wearing any of those pieces for a few weeks or months, then it’s safe to say you don’t need to keep those clothes. One of the most annoying parts of moving is having to transfer all of your clothing from one location to another. Before you decide to pack up every article of clothing you own, you may want to consider diminishing your wardrobe significantly. Additionally, if you are moving to a new state, you might want to think about how certain pieces of clothing will fare there. For example, if you are moving to Texas from up north, it’s not likely that you will need all of those wool sweaters you own. Consider donating them instead of having to move them across state lines. Do not donate clothing that is stained. We understand that you want to get rid of it, but we won’t be able to offer clothing that is ruined to anyone. If you think it is a good piece of clothing and it only has a small stain, you might want to consider having it professionally dry cleaned before you donate it. The same goes for clothing that has rips in it. Plain and simple, if it is too damaged for you to wear, it is too damaged for others to wear as well. Please make sure that articles of clothing that come in pairs are whole. For example, please do not just donate one shoe. If you are ready to help out those in need and do your closet a favor in the meantime, we would love to accept your donation at OUR Center. Our community closet is constantly growing in order to help the Longmont community which we are a dedicated member of. Contact us today to learn more about how you can donate or to ask any questions about our other community programs!